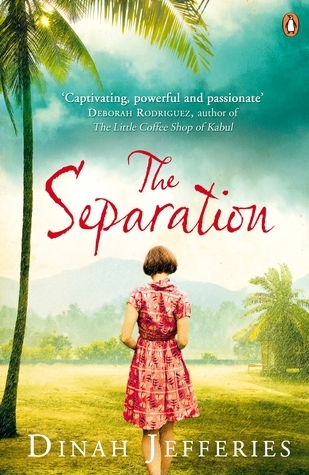 The Separation, by Dinah Jefferies, is a book filled with love and loss. Set in 1950’s Malaya and England, it tells its tale from two points of view: a mother separated from her children by a vindictive husband, and their young daughter who is torn from everything she holds dear without explanation. It is a story filled with tragedy and longing, of the misuse of power and the inner strength that can be found in times of crisis. The descriptions of Malaya are colourful and evocative throughout, placing the reader firmly within the mindset of post war colonialists living a gilded, threatened lifestyle in a country being torn apart by war. With danger and unrest a part of everyday life, the British drink and party, conduct affairs and look on the wide variety of locals as a sea of coloured faces to be subdued, used and feared. The immigrant men are arrogant, the women decorative, the risk of death an accepted part of life. The pictures painted of the Malayan towns and countryside convey a place of great beauty filled with underlying danger, of natural and man made oppression in keeping with the times. For the adult incomers there were fortunes to be made, for the children there was a freedom and magic unimaginable to those in England. The lifestyle in England provided contrast with its damp greyness and cramped conditions. The attitude of so many of the adults seemed alien to modern day thinking. With demands for control and dogmatic mind sets, the children were cowed into a submission they had no option but to accept. It made for painful reading. The author though writes beautifully. The story has depth, passion, fear and longing yet it is presented with a light touch that suggests as much as it describes. The tale is so much more than an historical account of family misadventures from days gone by. It transports the reader back in time to experience the lives and emotions as they were lived. I felt impotent loss and anger as I read, despair at the lies, pain at the tragedies, a glimmer of hope as the truth finally emerged. The scale of the story is breathtaking. The scope of the wrongs done to so many would have made for difficult reading had it not been for the skill of the storyteller. I enjoyed this book immensely. My copy of this book was provided gratis by the author at my request. This entry was posted in Book Review and tagged Dinah Jefferies, family, loss, Malaya, Penguin Books, The Separation.